Juno and the Paycock looms as one of Irish theater’s landmark plays. 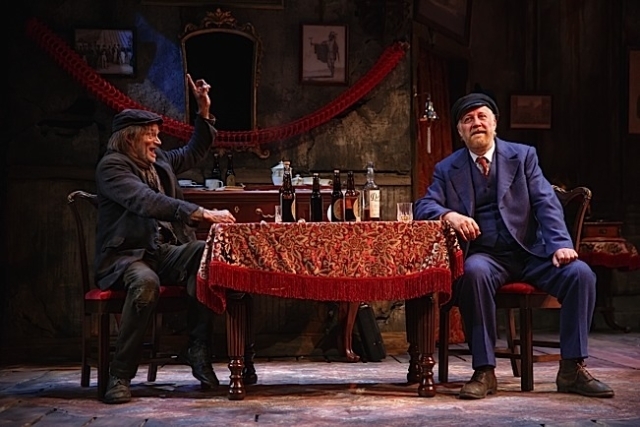 We in the Twin Cities are in an enviable position to see outgoing Guthrie Theater Artistic Director Joe Dowling’s staging of playwright Sean O’Casey’s 1924 classic. 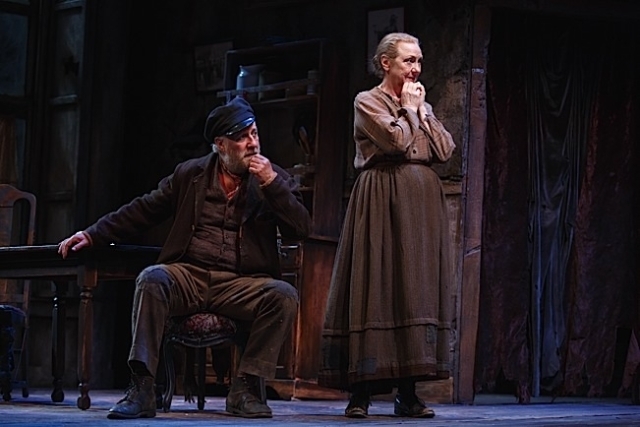 The dire social ramifications of the Irish Civil War and divisions sprung from that have been brought to gripping naturalistic life on the Guthrie’s proscenium stage. Juno and the Paycock is Dowling’s final production of his two decades as Artistic Director at the Guthrie, America’s flagship regional theater and the Midwest’s most prestigious theater. This is also the play that launched Irishman Dowling’s star in the US when it played on Broadway in 1988. This time around O’Casey’s humor-filled tragedy is a labor of wistful love and a Swan Song from a man who has changed the face of Twin Cities more than any person since Tyrone Guthrie. Also significant is that this is an Irish play staged by a man who has directed over 45 productions at Ireland’s pre-eminent Abbey Theatre, Dublin. You will sense that intensely intimate Irish connection during every second of this production. 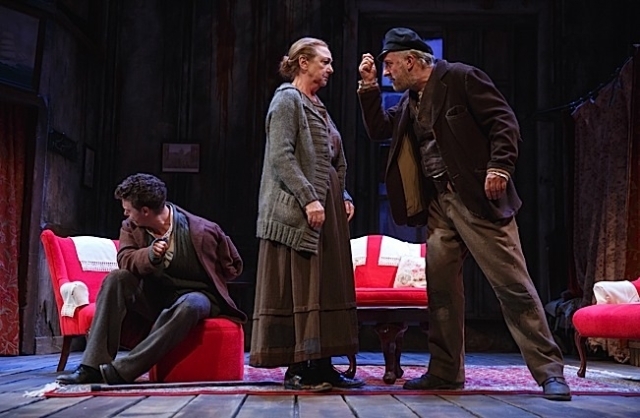 The cast is a marvelous mixture of distinguished Irish actors and seasoned Guthrie regulars. Juno and the Paycock is set in the mid-1920s during the Irish Civil War era. As with any war, the economy has been roundly devastated. As another Irish literary giant, William Butler Yeats, once said in another context: “the centre cannot hold”. Poverty runs rampant. Jobs are almost to totally nonexistent. Personal and household debts are ruthlessly collected. In the case of civil war, intractably hard feelings are left intact right in the very cities, villages, and as in the Boyle family’s case, neighborhoods. Bloody vengeance and volatile retaliation become the norm. Dowling’s Boyles are intensely believable. Juno the family of four’s matriarch is a salt-of-the earth matron who has desperately and lovingly kept her household together during a dark and dreadful time. Her husband, “Captain” Jack Boyle, who evades any kind of employment, is her proverbial “cross to bear”. An alcoholic spendthrift, it is his destructive misinterpretation of a financial occurrence that sets his house on a road to ruin. Beautiful daughter Mary is cruelly compromised by a disingenuous man of means. Son Johnny has been badly wounded by the war, and by simply and inevitably being a part of the war, he has sewn the seeds of future nightmares. Anita Reeves personifies Juno as a woman battered by events, yet focused in keeping to her course as best she can. It’s a luminous performance whose power sneaks up on you while watching. This is reflects Reeves’s genius. She subtly leads us to the play and her character’s inexorable devastating climax. The name “Juno” doesn’t refer to a Roman goddess, but is simply a nickname for “June”. That said, Juno, the Roman equivalent of Hera, wife of Zeus is the goddess of hearth and home and the Queen of Heaven. Stephen Brennan’s “Captain” Jack, dubbed the Paycock as a comparison to strutting peacock, is an appropriately and maddeningly unwieldy mess of a man. Brennan exposes the reckless, undisciplined effect of excessive imbibing with humor that then repudiates our laughter as we come to see just how destructive of his family, his drunken ways have affected them all. Katie Kleiger’s Mary and David Darrow’s Johnny are both heartbreaking. A quick note to those reading this who think “what a downer”. First, almost every major character in this play has some funny to very funny lines and moments. And this cast expertly mines O’Casey’s humor and Irish wit. Second, the ramifications of the situations O’Casey sets up will likely leave audience members, struck with insights about financial and lifestyle mistakes we can all fall prey to, even though the historical setting is different from our own. This play speaks volumes to our own time when income disparities and economic strife have yet to come under control after several years. Therefore, O’Casey has a resonance now that probably registers more viscerally with American audiences than it did in 1988 when things were perceived to be better economically. Sean Michael Dooley is seductively Apollonian as Charles Bentham, an opportunist into spirituality who deceives Mary in hopes of sheer financial gain. Sally Wingert is vibrantly spunky as neighbor, Maisie, a hardnosed fair weather friend. In one of his best performances ever, Mark Benninghoffen sparkles and disgusts as Joxer, another fair weather friend, who sees Jack as someone he can reliably exploit for liquor. It’s a very physicalized performance kinetically reminiscent of a weasel and a serpent rolled into one being and it suits the play magnificently. 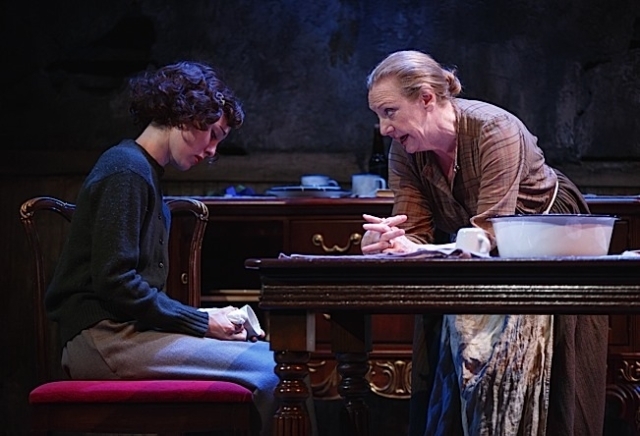 However, in one of the most wrenching short performances ever performed at the Guthrie, Dearbhla Molloy, gives us Mrs. Tancred’s monologue about a lost son that comes from some hidden reservoir so deep within it transcends to the heights of acting. We Americans know about how our Civil War pitted family against family. Mrs. Tancred’s speech reverberates with similar tragic understanding. You certainly don’t have to be an American Civil War buff to appreciate this, but if you are, you will likely find an added affinity with this production. Molloy is a major figure in the UK and Ireland. You may know her as Michael Palin’s wife in the delicious politically incorrect British 1990s television series, GBH. Something I think is synchronistic is that one of Molloy’s GBH co-stars recently gave one of the most powerful short performances in contemporary film: Lindsay Duncan as Tabitha, the critic, in Birdman. Wouldn’t it be something to put these two women in major roles in a play onstage! 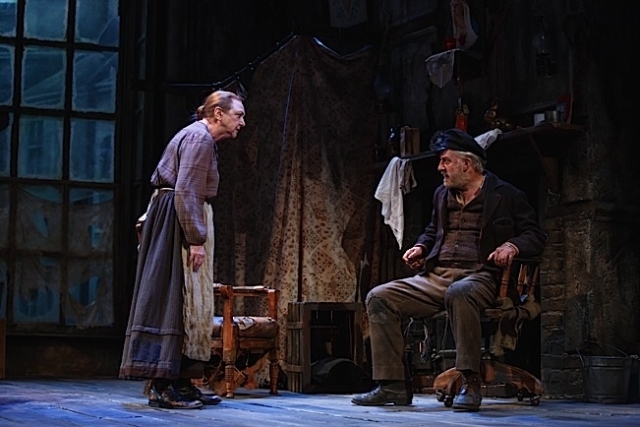 Frank Hallinan Flood’s set design executed for the Guthrie by Michael Hoover is a grim vision of interior Dublin tenement life. It has the palpable sense of a newspaper sketch come to life. Frank Butler’s lighting accentuates the oppressiveness to moody, even grim effect. Christine A. Richardson’s costumes reflect the impoverished war-worn setting to perfection. The Guthrie’s program for Juno and the Paycock is quite excellent. It is not necessary to read over it before you see the play but it will definitely enhance your experience if you do. Moreover, for those who grew up hearing about events in Ireland and the IRA on television and want to fill in some intellectual blanks or who are younger and curious, you will find what you read there illuminating. By the way, the programs during the Dowling era, have been fine commentary works in themselves. I myself have saved many of them.